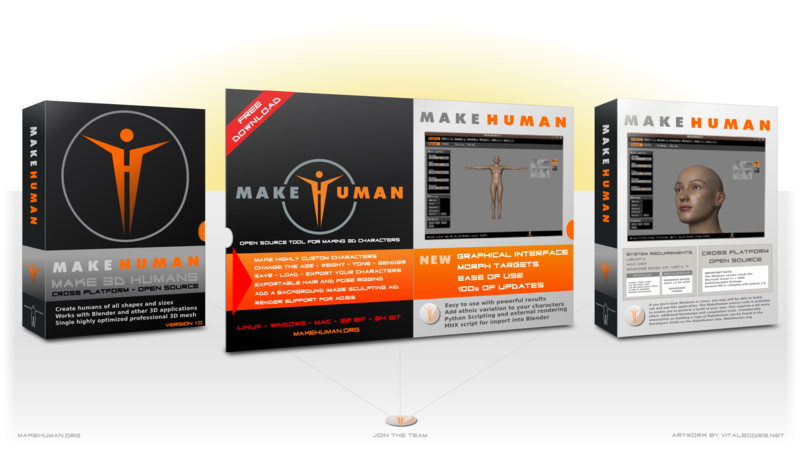 MakeHuman(TM) is an open source (so it’s completely free), innovative and professional software for the modelling of 3-Dimensional humanoid characters. Features that make this software unique include a new, highly intuitive GUI and a high quality mesh, optimized to work in subdivision surface mode (for example, Zbrush). Using MakeHuman, a photorealistic character can be modeled in less than 2 minutes; MakeHuman is released under an Open Source Licence (GPL3.0) , and is available for Windows, Mac OS X and Linux. Nightly builds: The developer version(s) for people who are actually building or testing the software (makehuman). makehuman-alpha: What is needed to get the current alpha version. Stable version: Not available yet – software is still in alpha. Note: The makehuman-nightly and makehuman-alpha debs are mutually exclusive, so installing one on the system will remove the other. Note: Alpha 5 with do this automatically. AQSIS: Make sure you completely remove AQSIS 1.2 and install AQSIS 1.6 or newer in the System > Administration > Synaptic Package Manager so that make human renders properly. Once downloaded you can install them with a right click and then – Open with Gdebi Package installer – or the like. I was able to get them recompiled using this method. The other way that is suggested to to delete the 6 .sl files in the /usr/local/makehuman/data/shaders/renderman folder and restart MakeHuman. OTHER NOTES: You should be able to render (in color) and export a mesh with the current Makehuman-alpha version (Alpha4) or later. VitalBodies would like to thank the MakeHuman team (and Joel Palmius, aka joepal on MH forums for the deb files for Ubuntu) for all of your efforts!